Welcome to Rockville Alpaca Farm! RAF is a small, family operated farm on several acres about 20 miles west of Richmond, Virginia. We officially began in June of 2011 with the arrival of our herd, and as you can tell from the date, we are very new to alpaca farming. New, but very excited and in awe that we have these beautiful animals on our property. 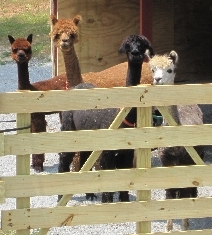 Our goal and motto is to “Raise strong, healthy and happy alpacas in central Virginia”. We will be offering boarding and breeding services at our farm. Our main focus will be on the wonderful soft, warm, hypoallergenic fiber the alpacas produce. In addition to all the super garments that can be made, many new products are being developed such as mulch rings, and warm boot pads to name a couple. We would also be excited to help anyone interested in starting a farm of their own. If you have an interest, just give us a call – we will invite you to come and see first hand what a small farm looks like. Every day we discover new information about our alpacas just from watching them. The little habits they have are fascinating to us. Things like – they would rather drink the water from the hose than the bucket, or it doesn’t matter how many feeding bins there are – they always want to eat from their neighbor’s bin. Or, who knew the freshly drawn water in the water bucket also doubles as an alpaca footbath? They make us laugh and give us a sense of peace as they are very serene and peaceful animals. A little over a year ago, we didn’t know what an alpaca was! Never in a million years did we picture having a farm – but we love it and there’s no turning back.